MYGALOMORPHS The family Mygalomorphs includes some of the largest, most ancient and most dangerous spiders in the world. In Australia we have 10 families of Mygalomorphs. Included within are the Funnel-web, Mouse and Trapdoor Spiders. Massive fangs glisten with venom as the body of this formidable spider rears up – ready to make the first of its many repeated strikes. The Funnel-web family, uniquely Australian, includes the spider that is considered by many to be the world’s deadliest spider – the Sydney Funnel-web (Atrax robustus.). The increase of urban sprawl along the east coast of Australia has seen humans encroaching upon the Funnel-web’s natural habitat – hence the corresponding increase in the incidence of reported bites. Before the development of the antivenom in 1980, at least 13 people had died from the bite of a male Funnel-web. There have been no fatalities since. The largest of the Funnel-web spiders, the female Northern or Tree-dwelling Funnel-web is twice the size of the male and can span the width of an adult’s hand. Both males and females are potentially dangerous and the toxins they inject may be fatal. Fortunately, this spider is rarely encountered as it inhabits heavily timbered areas rarely visited by people. The colors of the female and male of this species are so dissimilar, that they were once thought to be members of two distinct species. 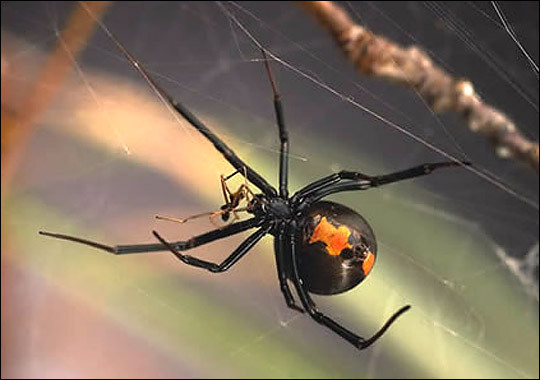 The female is glossy black, whereas the male is much more distinctive, with his orange to bright red fangs and head. They both appear stumpy because of their wide body and short legs. Immature males live in burrows until maturity. Largest of all Trapdoor spiders, with a leg span of up to 16cm. The Whistling Spider gets its name from the hissing noise it makes when disturbed. Although not naturally aggressive, it will rear up with its large fangs poised ready to strike. Selenocosmia is the most common genus of Whistling Spider in Australia. Bites from such a large spider would be painful and cause symptoms such as nausea and vomiting, however, they are not deadly. Seek medical advice. Bite Prevention Spiders do not set out to harm people. A common sense approach will reduce the chances of your being bitten by a spider, and in most cases, prevent it from happening. Wearing suitable footwear and gloves while gardening and exercising caution when moving things around your shed or garden are examples of simple precautions that should be taken. The vast majority of spiders are harmless to humans. A bite from most spiders will heal quickly, producing very few side effects. Even the more dangerous spiders in Australia rarely produce effective envenomations. (People react differently. The type of reaction depends upon a number of factors that range from the size of the spider, to the size of the person.) On most occasions, first aid will not be necessary for spider bite victims. However, it is always best to be cautious. 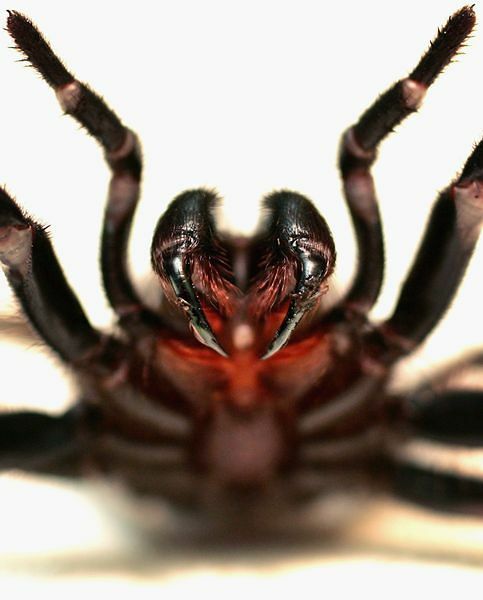 Suspected bites by Funnel-webs and Red-backs should always be taken seriously and medical advice should be sought immediately. The pressure-immobilization method should only be used in the treatment of a Funnel-web Spider bite. 1 Remove the patient from danger. DO NOT attempt to catch the Funnel Web, but note any distinguishing characteristics that will assist with its positive identification. 2 Reassure the patient, keeping them as calm and as still as possible. Do not clean or even wipe the bite. Any residue of venom from skin or clothing can be used by medical staff for positive identification of the offending spider. 3 Apply a broad, firm bandage directly over the bite and as far up the limb as possible, remembering to keep the limb still. Even removing clothing would cause movement which must be avoided. The same tension that you would use for a sprained ankle is enough; the aim is to restrict the lymph flow and not restrict the blood flow. The bandage should be able to be tolerated comfortably for some hours if necessary. (Creep bandages are the most ideal but torn up clothing could also be used). 4 immobilize the limb by applying a splint, over clothing if necessary. A bitten arm can be immobilized using a splint and a sling; an effective method of immobilizing a bitten leg is to bind it to the patient’s other leg. 5 Call an ambulance and be sure to give precise directions as to your location. Bring transport as close to the victim as possible. 6 Ask the patient questions to obtain a brief medical history: e.g. Is the patient an asthmatic? Are they using any medication? This information may be important. 7 DO NOT give alcohol under any circumstances. If respiration stops, administer mouth-to-mouth resuscitation. 8 The pressure bandage should not be removed except by medical staff. Keeping the victim still and calm is one of the most important actions. Panic only hastens the spread of the venom through the lymphatic system and also makes it difficult for medical staff to separate the symptoms of Funnel Web bite from shock. Antivenoms are now available for funnel web bites. With prompt action, proper first aid and medical treatment, surviving even the most serious of Funnel Web bites is a high probability.